Fall is here and that means it’s time to break out the pumpkin recipes! Here are 7 choices that caught my eye. From baked goods to savory dinners, pumpkin finds its way into everything this time of year. And for good reason too! Not only is it addictively delicious – case in point, pumpkin spice lattes – but the real deal is healthy too. It’s contains nutrients like post-workout restorative potassium, cancer-fighting beta carotene, and immune-boosting vitamin C.
Prefer to use fresh instead of canned pumpkin? Be sure to check out these tips to help bake it in the oven, boil it on the stove, or simply microwave it to make a homemade pumpkin puree. It’s easy to whip up a pumpkin quick bread, but when you want to wake up to a special morning treat, there’s nothing like these muffins. They’re pumpkin on the outside with extra pumpkin on the inside, plus plenty of fall spice. 1. Preheat the oven to 400°F. Whisk together flours, 2 Tbsp. granulated sugar, 1/4 tsp. salt, baking powder, pumpkin pie spice, cinnamon, and cloves. 2. In a large mixing bowl, combine 1 cup pumpkin puree, 1/4 cup brown sugar, 2 Tbsp. applesauce, heaping 1/4 cup coconut oil, and almond milk. 3. Gently fold the dry ingredients into the wet mixture, adding 1/3 at a time until just combined. Do not overmix! Using an ice scream spoon, scoop the batter into a greased muffin tin. Set aside. 4. Make the filling. In a small bowl, combine the remaining pumpkin puree, sugars, applesauce, coconut oil, and sea salt. Scoop about 2 tsp. of the pumpkin pie filling onto the top of each muffin. 5. Bake for 18–20 minutes, or until a toothpick comes out clean of batter. Let cool completely. Enjoy! 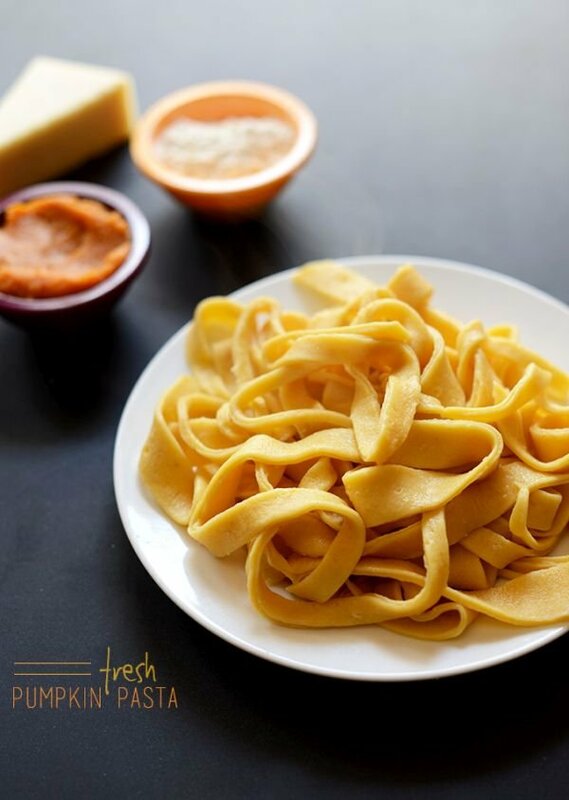 Inject pumpkin into a rustic Italian dinner with this recipe for homemade pasta. Before you start pricing pasta makers to process the dough, take a look at the instructions. There’s nothing required except a rolling pin (or wine bottle) and a pizza cutter or trusty knife. To serve, you can get creative with the sauce and topping, or blend together a simple pesto of fresh basil, pine nuts, garlic, olive oil, and Parmesan. 1. Add flour and salt to a food processor, and pulse. Then add in the eggs and the pumpkin puree. 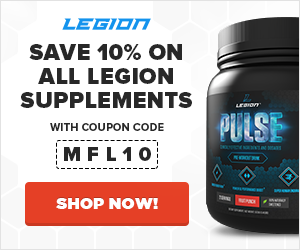 Pulse until well combined. Then drizzle in water until a dough forms. 2. Transfer to a very lightly floured surface, sprinkle the top with a little flour, and cover with plastic wrap. Set aside for 30 minutes to rest. 3. After it’s rested, bring a large pot of water to a boil and salt generously. 5. Once the dough is nearly paper thin, cut it into any shape you want. You can even leave it in a solid sheet if you’d like. It’s easy to use a pizza cutter to cut it into fettuccini-sized strips. 6. Cover with plastic wrap until ready to cook. Add pasta to boiling water, and stir just to make sure they don’t stick together. It should only take 1–2 minutes to cook. 7. Drain, and transfer to a serving plate. Top with sauce of choice. It wouldn’t be fall without pumpkin pie. But you can give in without consuming a ton of flour, sugar, and butter. This recipe starts with a classic crust of crushed walnuts. Then a rich filling is created from pumpkin, coconut milk, and eggs. There’s plenty of spice – AKA low-calorie flavor – yet only a splash of maple syrup. 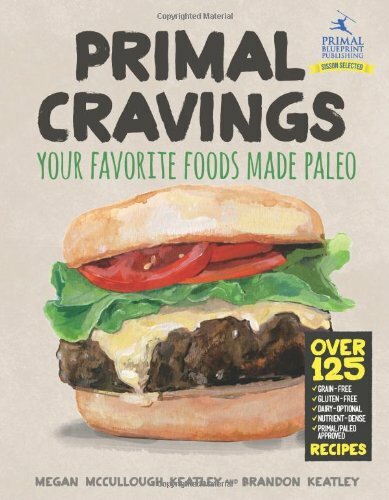 More recipes like this one, created from wholesome ingredients, can be found in Primal Cravings: Your Favorite Foods Made Paleo and other cookbooks in the Primal Blueprint series. 1. Preheat the oven to 350°F for the crust. Blend walnuts, baking soda, and salt in a food processor until finely ground. Add butter, and pulse until it’s mixed in. 2. Scrape the batter into a 9-inch tart pan. You can use a rubber spatula to smooth the batter over the bottom and up the sides, but ultimately your fingers will be the best tool. Take your time smoothing and patting the batter out evenly. It’s better to spread the batter thinner across the bottom of the pan and thicker around the edges of the crust. 3. Place the pie on a cookie sheet, and bake for 15 minutes. Remove from the oven, and set aside to prepare the pumpkin pie filling. 4. In a large mixing bowl, beat the eggs. 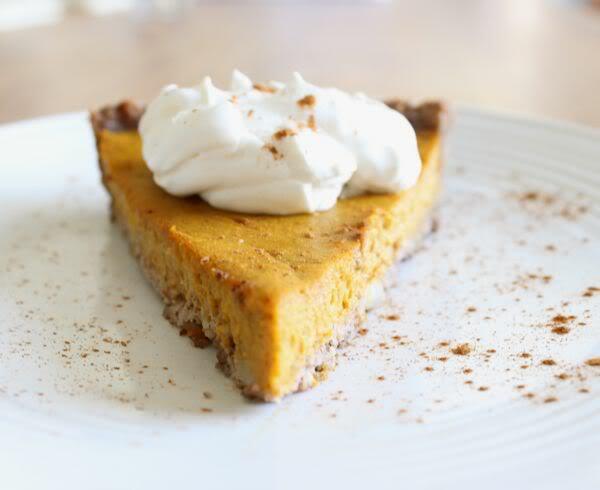 Mix in the pumpkin, coconut milk, vanilla extract, maple syrup, and pumpkin pie spices. Pour into the pre-baked crust, careful not to overfill. You might have a little batter left over. 5. Bake for 50 minutes. The center of the pie should be fairly firm and only jiggle a tiny bit if you shake the pan. Let the pie cool completely before cutting into it. Serve with a dollop of whipped cream. Craving pumpkin for dinner? This traditional Afghani dish includes mint yogurt and a spiced tomato meat sauce, but the star ingredient is sugar pumpkin. The recipe is from the much-loved Helmand Restaurant in Cambridge, MA, and it’s fancy enough for a holiday table or romantic dinner. 1. Preheat the oven to 300°F. Wash off the outside of the pumpkins, and cut them in half. Scrape out the insides, and cut into 3”–4” pieces. Peel them deeply enough that you get rid of all the green and rind. 2. Find a baking pan large enough to hold all the pumpkin pieces in a single layer. Use multiple pans, if need be. Cover the pumpkin pieces in the oil, and place them hollow side up in the pan(s). Pour the sugar evenly over the pumpkin pieces. 3. Cover the pan(s) with aluminum foil. Bake for 2 1/2 hours, and then baste the pieces with the pan juices. Cover them up again, and bake for another 45 minutes. The sugar will melt away and end up partially absorbed. The pumpkin pieces will turn dark orange and translucent. 4. Make the yogurt sauce in a small bowl, mixing together the yogurt, 2 cloves minced garlic, dried mint, and 1/2 tsp. salt. Cover and refrigerate until ready to serve. 5. Brown the onions in the oil in a heavy-bottomed saucepan. Add the meat, stirring so it is broken up into small pieces, and cook over medium-high heat until the pinkness is almost entirely gone. 6. Add the chopped tomato, 2 cloves minced garlic, ground coriander, black pepper, ground turmeric, and remaining salt. Cook, stirring, for another 5 minutes or so. Stir in the tomato paste; then add the water, and bring to a boil. Lower the heat, and let simmer, covered, for about 15 minutes. 7. 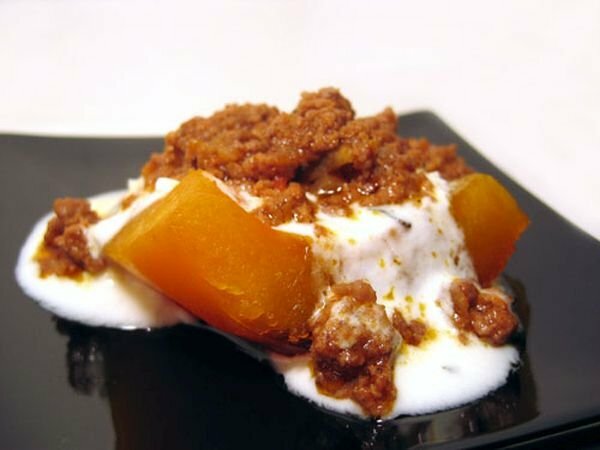 Serve the hot pumpkin topped with cold yogurt sauce, and spoon on the warm meat sauce. Dig in. 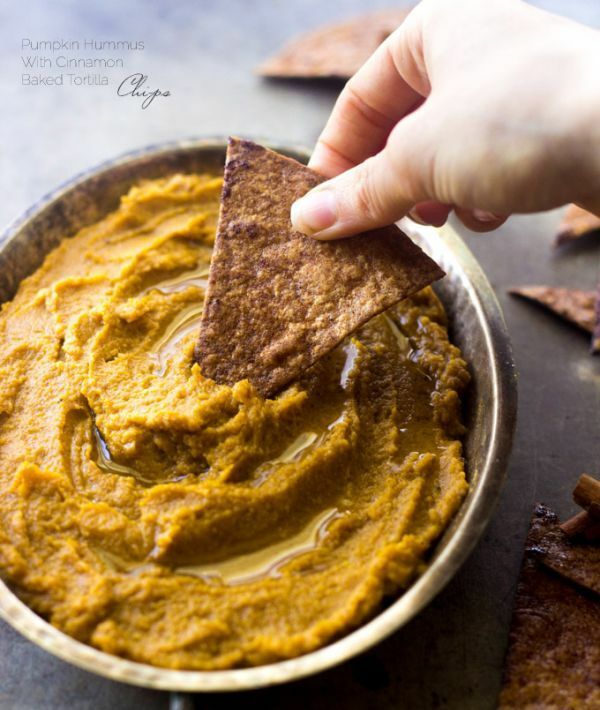 If you’re looking for an impressive but quick appetizer – or a wholesome snack – give this pumpkin-infused dip a try. It goes well with pita chips or even whole-wheat bread, but it takes hardly any extra effort to make these homemade tortilla chips sprinkled with cinnamon and sugar. 1. Preheat the oven to 350°F, and rub a cookie sheet with melted coconut oil. Set aside. 2. To de-skin the chickpeas, drain and spread them out on a paper towel. Gently squeeze each chickpea until the thin, papery skin comes off. 3. Add the chickpeas, pumpkin, maple syrup, pumpkin pie spice, and 2 tsp. coconut oil into a small food processor. Blend until smooth. You may need to stop the processor and scrape down the sides every so often to get everything smooth and well mixed. It can take about 5 minutes. 4. Cut the tortilla into 8 triangles, and lay them on the prepared cookie sheet. Bush with half of the melted coconut oil, and then sprinkle with cinnamon and sugar. Bake for 8 minutes, or until lightly golden. 5. Flip the tortillas, and brush with the remaining coconut oil. Sprinkle with more cinnamon and sugar. Bake for another 7–8 minutes until the tortillas are deep, golden brown. 6. Drizzle the hummus with additional melted coconut oil, if desired, and devour with the chips. Pumpkin fanatics don’t just stop at fall; they indulge in pumpkin year-round. But not all pumpkin products boast a long shelf life. This granola, however, makes it easy to eat pumpkin 24/7/365. Have a couple handfuls as a quick breakfast, toss it on top of yogurt for a snack, or keep it in your gym bag for a way to refuel post-workout. 1. Place two racks in the oven equal distance apart. Preheat the oven to 325°F. Line two baking sheets with parchment paper or silicone mats; set aside. 2. In a large bowl, combine oats, pumpkin seeds, pecans, coconut flakes, quinoa, chia seeds, cinnamon, pumpkin pie spice, and ginger. Toss to combine. 3. In a medium bowl, mix together pumpkin puree, maple syrup, honey, coconut oil, vanilla extract, and salt. Continue to whisk until smooth and combined. Pour over the dry ingredients, and mix until everything is moistened. 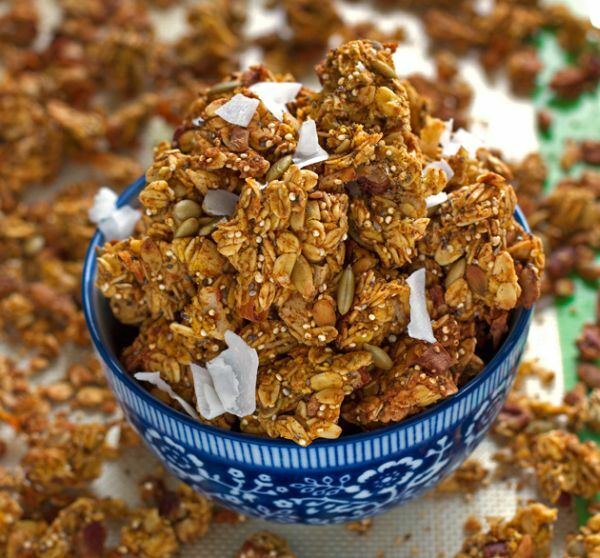 To get big clusters, shape some of the granola by firmly pressing teaspoon-sized amounts into a ball. 4. Evenly distribute the granola mixture between the two baking sheets. Bake for 40 minutes, stirring every 10–15 minutes and flipping the big clusters. Allow the granola to cool for at least 20 minutes. It will get crunchy once cooled. 5. Cover tightly, and store at room temperature for up to a week. It will get softer over time because of the pumpkin; spread in a single layer on a baking sheet, and bake again at 325°F for 10–15 minutes to refresh. Let cool before enjoying. This recipe combines butternut squash and pumpkin for a soup that screams fall. And it’ll look beautiful on your table when topped with a dollop of Greek yogurt and a few bright spots of pomegranate. 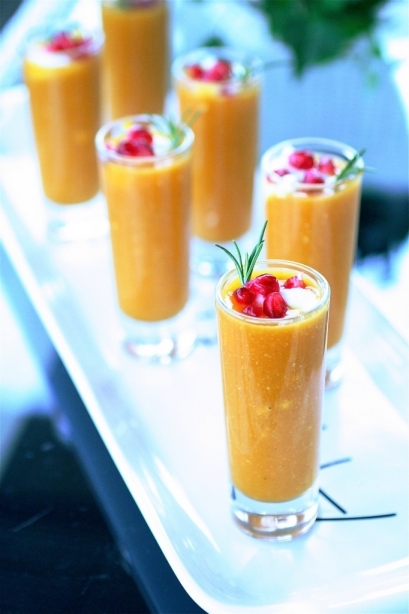 Serve in bowls, or make a fancy fall appetizer by using shot glasses. 1. In a large stockpot or Dutch oven over medium-high heat, combine the butternut squash, pumpkin, apple, onion, brown sugar, salt, cinnamon, and pepper. 2. Add the vegetable broth, and stir to combine. 3. Bring the mixture to a boil, and reduce the heat to low. Simmer, stirring occasionally, until the squash/pumpkin is tender. It’ll take about 20–25 minutes. 4. Very carefully, using an immersion blender (or a countertop blender in batches), blend the soup until smooth. 5. Return the soup to the pot over low heat, and mix in the milk and yogurt. 6. Cook, stirring occasionally, until completely heated through, about 5–10 minutes. 7. Add a dollop of yogurt on top, and sprinkle with pomegranate seeds. Serve. 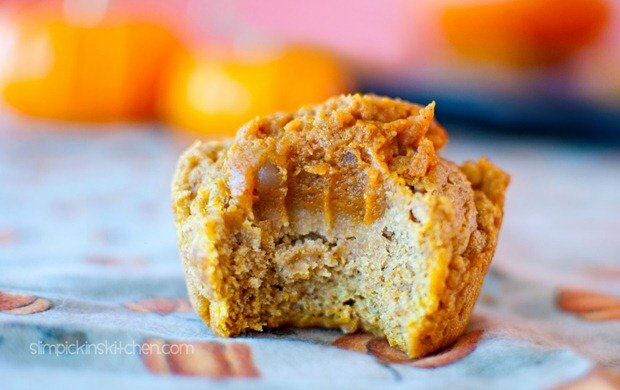 What did you think of these healthy pumpkin recipes? Have anything else to share? Let me know in the comments below!